Polymer Characterization and Particle Sizing, What Is the next Step? Employing a 30mW, 660 nm diode laser - the BI-MwA uses 7 angles to determine the intensity of scattered light as a function of angle and polymer concentration. Using this information, the system software is able to quickly produce Zimm, Berry and Debye plots from which weight average molecular weight (Mw), radius of gyration (Rg), and second viral coefficient (A2) data are calculated. The BI-MwA can be used in batch or flow mode, as part of a multi-detector GPC/SEC system, or for following the kinetics of polymerization using the time-dependent static light scattering (TDLAS) technique. Compactly designed, the flow path of the BI-MwA is vertical avoiding trapped bubbles - a problem commonly associated with horizontal light scattering systems. The robust cell inside the BI-MwA has no sharp corners, only conical shapes meaning previously analysed samples are much more easily flushed out. The BI-MwA is simple to use but incorporates sophisticated features. Inject your sample into the low-volume, 7-angle flow cell. The sample is illuminated by a temperature stabilized, precision power-controlled diode laser. The ultra-stable, high-sensitivity, low-noise CCD detector automatically collects the scattered light. Then, the software extrapolates the data to zero angle for the absolute molecular weight determination. 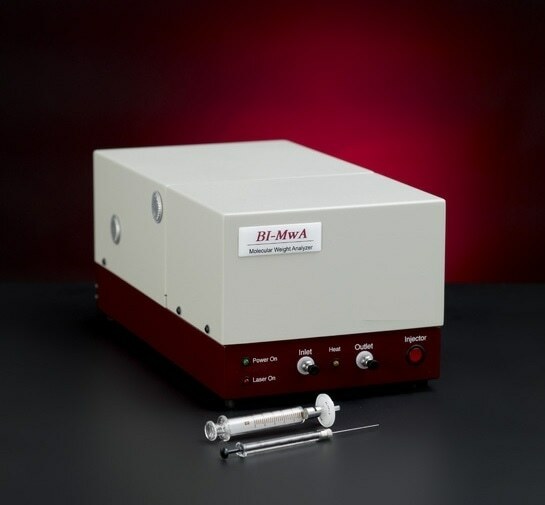 Best of all, the BI-MwA has the highest performance/price ratio of any light scattering detector used for molecular weight determination.